London snot-poppers False Heads return with an EP as gritty and as uncompromising as the band themselves. Louder Than War’s Dave Beech reviews. At a time when the country is becoming increasingly more divisive, and indeed divided, it’s becoming increasingly clearer that something needs to happen in order to politicise its youth beyond that of leftist memes and football-like chants; something that’s not been seen en masse since the ‘70s. We’re not saying that False Heads are that driving force that will galvanise our country’s youth, but they are just about the only band around staying true to their principles, their roots and their politics, and they aren’t afraid to tell people how it is, or of who they piss off in the process. And that’s as close to true spirit of punk as one can find at the moment. While much of the country’s current punk bands seem preoccupied with posturing and trying to be clever, False Heads have always offset their airs and graces and gone straight for the jugular; more rusty chainsaw than finely honed sabre. 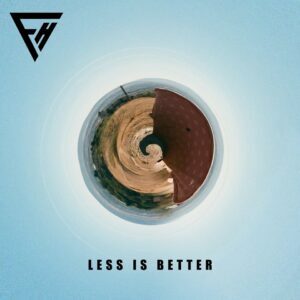 That’s no bad thing however, and their latest EP Less Is Better is the perfect introduction to such an acerbic aesthetic. Help Yourself, the most recently written track on offer, is the best example of this. Though still harbouring the same sense of freneticism and the same piss and vinegar lyricism the band have made a name for themselves with, there’s a sense of refinement, (at least as refined as False Heads get), a feeling of the band seriously upping their game in just about every aspect possible. Of course, that doesn’t mean to say that Less Is Better is breaking any boundaries at least as far as the music goes. It doesn’t need to, nor does it set out to. What it does do however is solidify False Heads as one of the UK’s most vital and most visceral punk bands around at the moment. And while no-one is expecting them to single-handedly energise the country’s youth in the same way bands like Crass or the Clash did, if there was one band whose spirit and vigour is strong enough and whose politics are accessible enough, then this is them. A vital release from one of the UK’s most important bands. False Heads can be found on their website: FalseHeads.com, Facebook and they tweet as: @FalseHeads.